Philo Brathwaite ran away with it to win his second Samui Swine Classic. Held on the island of Koh Samui off of Thailand’s southeastern peninsular coast, the Samui Swine Classic has without a doubt become the premier late winter vacation and early tour season event. Now in its sixth running, the Swine is the brainchild of transplanted Californian barbecue maestro Nigel Mills and his suay Thai wife, Tiger. Playing tournament disc golf in February in a tropical breeze, amidst palm tree groves and water buffalo, is paradise. But as an A-tier level event, the Swine is not just about its exotic locale. With Dynamic Discs and many local sponsors, generous Amateur player packages, added cash for the pros, and delicious Thai food and ice cold drinks on hand, it’s a first-class affair. Not to mention Nigel’s post-event tradition of roasting a whole pig served up with other carnivorous delicacies for the participants on his gigantic smoker. Every year, Mills christens the festivities with a theme that combines a famous movie and pit BBQ. All told, the 2019 “Hogfather” attracted 70 amateur players and 51 pros from a remarkable 20 countries, making it one of the most international celebrations of our sport outside of the PDGA Majors. As has become tradition, and having fled their frost-bound homeland, the 28 strong Finnish farang horde led the pack. Reflecting the unfolding emergence of this region as the next hotbed of our sport was the representation from seven eastern Asian countries, including travelers from Korea, Vietnam, Japan, China, Singapore, and Malaysia. Nigel has also continued to lengthen and strengthen the course layout which is now a well-manicured 11-hole track played twice for a 22-hole round each day. The circuit consists of five must get, less than 200-foot birdie holes, five testing par 3s, and the signature 191-meter par 4 (hole 6). Every hole features out-of-bounds and/or a perfectly fair mandatory tree. Failure to negotiate the gap lines between the coconut palms can send one’s scorecard soaring. The amateur competitors had their spotlight in the sun on Wednesday and Thursday. Seizing the day and the gold medal in the Advanced division was British expat and local resident Nick Georgiou, who held off a rare competitive appearance from Terry “The Disc Golf Guy” Miller by a single throw, and hard-charging Pejman Norouzi - his 10 down 58 in round 2 was better than world-class rated. Fellow Finns Minna Sellman and Ville Kolari topped the podium in the Advanced Women's and Amateur Masters Women's 40+ divisions respectively, while seasoned Koh Samui snowbird Chuck Czepyha was the class of the Amateur Masters 50+ field. 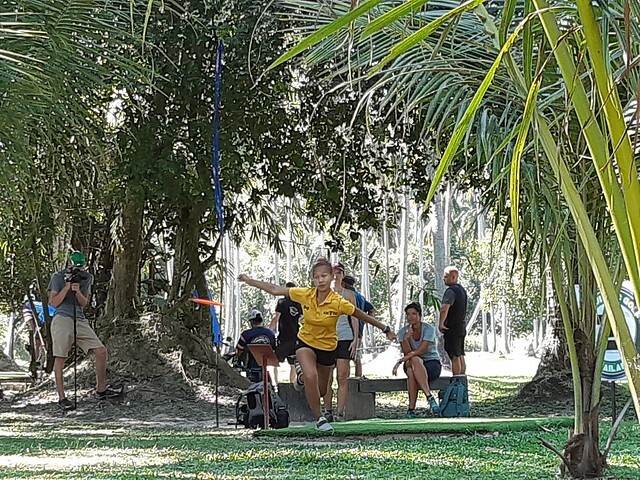 There was also a “shot heard round the world” when Redha Fahmi Radzuan smoothed a 43-meter forehand for an historic hole-in-one, the first ace ever thrown by a Malaysian player at a PDGA event. The storylines among the professionals were led by Los Angeles-based Barbadian and now two-time Bacon Belt winner, Philo Brathwaite. He saved his hottest golf for showdown Sunday, birdieing 10 of 11 with a string of smooth midrange shots and dead center putts through the middle stretch to pull away from fellow American touring pros Nikko Locastro, the 2018 Swine Champ, and newcomer to Thailand, Devan Owens. Finishing at 36-down over 66 holes, Philo’s final round course record 15-under-par 53 earned a rating of 1063. Rounding out the top 4, Samui sojourner Joel Pallari was on pace to tie for 2nd place with 12 holes to go, until his hot putter and palm tree love ran out. The Open Women's division was witness to the upset of the weekend, with Swiss Miss Tabea Wallus besting home course favorite and Siamese sensation View Georgiou for the biggest win of her young career. In turn, a pair of vacationing American old boys triumphed in the age-based competitions: Wisconsin’s Johnny “Rumble” Pecunia played near world-class golf to run away with the Masters 40+ division, while Michigander Jerry Stoken proved the class of the Masters 50+ field. If you weren’t here in Thailand to witness the action firsthand, SmashBoxxTV will be posting their spicy video coverage of the Hogfather soon, so that you too can start dreaming of a disc golf holiday in paradise. While many players are now heading to the airport and back to reality, others are bound for the final stop on the south-east Asian swing - Dave Lehmann’s Hyzenbrownie event on the south shores of Koh Samui. In the meantime to our naamjai hosts, Nigel Mills and family, we can only say khorb kun mak (thank you so much)!